Troy Aikman is a former quarterback who played twelve consecutive seasons with the Dallas Cowboys (1989-2000). Aikman was the number one overall draft pick in 1989. During his career he was a six-time Pro Bowl selection, led the team to three Super Bowl victories, and was the Super Bowl XXVII MVP. Aikman was elected to the Pro Football Hall of Fame in 2006 and to the College Football Hall of Fame on December 9, 2008 in New York City. He currently works as a television sportscaster for the Fox network. Aikman is a former joint owner of the NASCAR Sprint Cup Series racing team, Hall of Fame Racing, along former Cowboys quarterback Roger Staubach, and is a part-owner of the San Diego Padres. PFP Sports & Celebrity Talent Agency is a top booking agent for motivational sports speakers and celebrities. 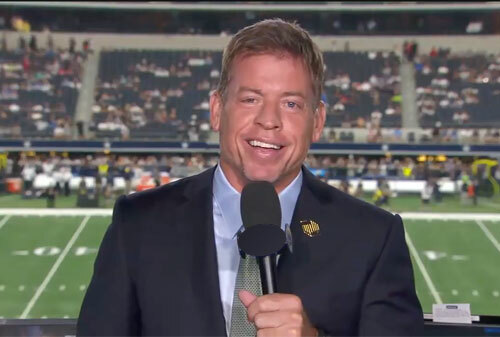 If you would like to book NFL stars like Troy Aikman for a speaking engagement, personal appearance or special event, you can request Troy Aikman agent and speaker information from PFP Sports & Celebrity Talent or call 800.966.1380.